15 most popular Historical Places in India (with pictures) – Best of India! The first question that comes to my mind, to begin with, this article is how many of us who are born and living in India know our country in depth? I am sure most of us do, but at the same time, it’s also true that few of us are not aware as to how the almighty has decorated our beautiful motherland by enriching her with several destination places that needs to be explored. India is a land of diverse religion. This is the reason why our country has drawn people from all around the globe for several decades now. This variety of religions includes the Jains, Buddhists, Sikhs etc. Our non-secular country attracts people from several locations due to the presence of historical temples, ancient old monuments and various outstanding architectural mastery. There are so much of attractive cultural destinations are there in India to explore that it will leave your mind in awe. Today you and I are going to take a tour of 15 such popular Historical Places in India and take a look at their centre of attractions and get to know them deeply. Let’s Go…. Known as one of the Seven Wonders of the World, the Taj Mahal is one of the major and a must-visit historical tourist spot located in Northern India. Build in the year 1631 and situated in the southern bank of the Yamuna River in Agra, the Taj stands out as one of the most remarkable piece of architecture not only on India but also the World. 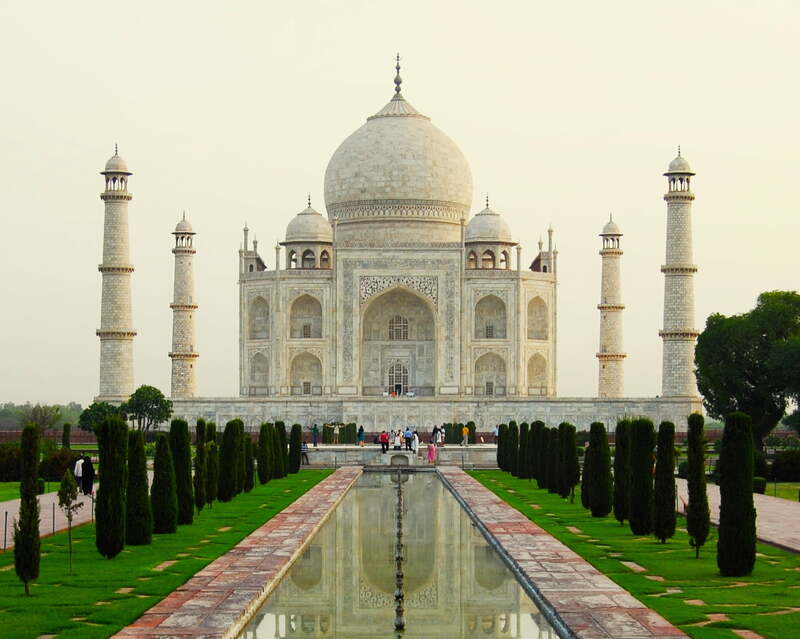 This magnificent piece of a structure was named after Mumtaj Mahal, wife of the Mughal Emperor Shah Jahan. The features of this place include construction in white marble, laid with several other stones namely, the jade, crystal, lapis lazuli, amethyst, turquoise etc. It is embellished using calligraphy involving Persian verses, reflective mosaic glass, along with mind-blowing garden and a swimming pool that reflects.At the front of the Taj Mahal complex enclosed the main entry of pink sandstone in addition to a square patio divided into sectors by extensive pools of water, and a red sandstone mosque together with an identical construction known as JAWAB, can also be called a mirror, directly upon from the mosque. This is a world heritage spot as per UNESCO site inscription 1983. All in all the Taj Mahal features as a spectacular iconic figure associated with India’s wealthy history. 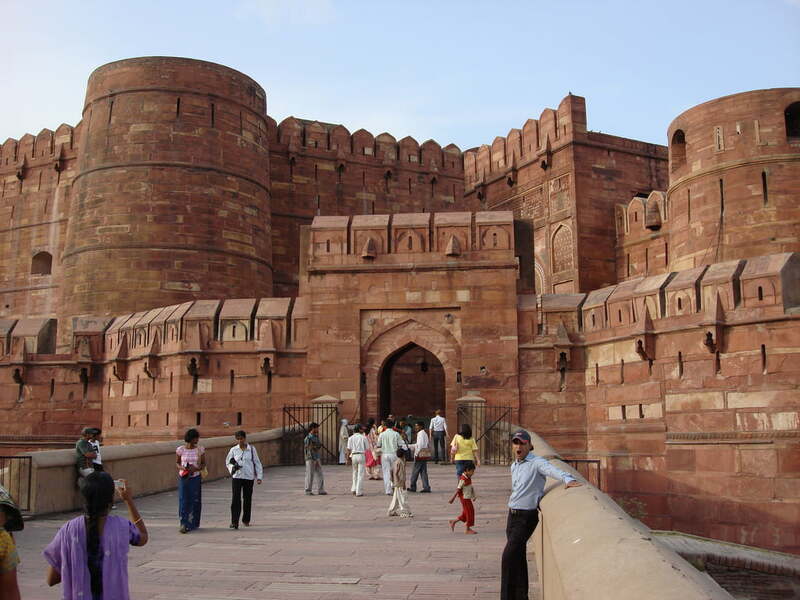 The Agra Fort was built by the Great Mughal Emperor Akbar, a symbol that is associated with courage, strength and energy. This Fort was enrolled in UNESCO World Heritage site inscription in the year 1983.The Fort designed in reddish sand natural stone, and is actually constructed in a semi-circle where four entrances are constructed that guards the particular Fortress together with walls that are 70ft. in height.The Fort was build in order to guard the richest treasure “The Kohinoor” and significantly marked vigour of the Mughals.If you visit the Agra Fort, then Diwan-I-Am, Royal Pavilions, Nagina Masjid, Mina Bazar, Jahangir Palace and Mina Masjid etc. are the places that you must pay a visit on. 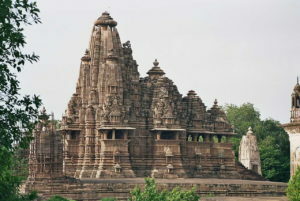 This piece of architecture is another trademark of Indian History. Also a World Heritage tourist spot, the name Jaisalmer Fort was drawn from the name of Rawal Jaisal, a Rajput ruler who build this Fort. 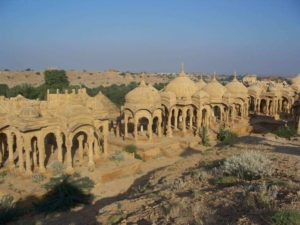 It is located amongst the Great Thar Desert, on the Trikuta Hill Rajasthan. 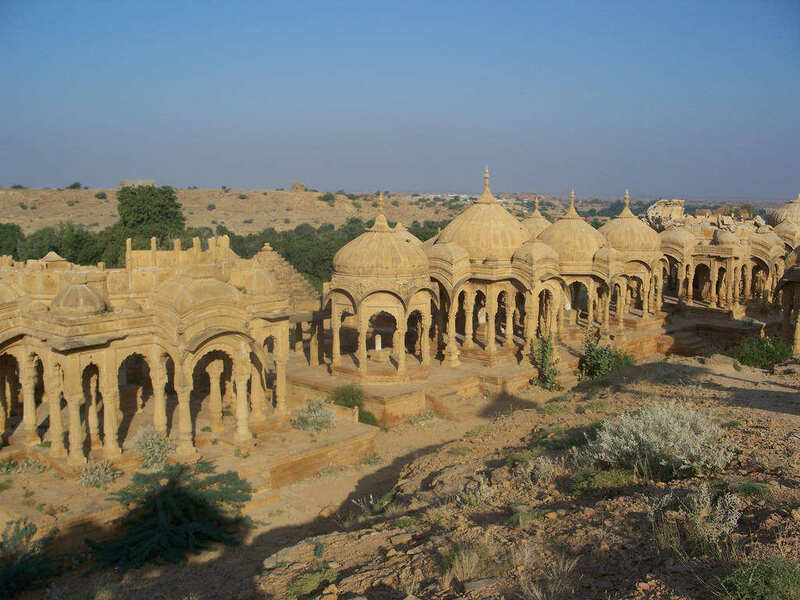 The Jaisalmer Fort symbolises the mark of tradition and culture of the Rajputs. The length of this fort is about 1500 ft and width wise it is n750ft with a huge cannon located at the front gate of the fort. The places to visit include Hindu Laxminath Temples and the Jain Temples that can be located inside the fort. You can find carved sculptures as a sample of trademark architecture here inside the temples. 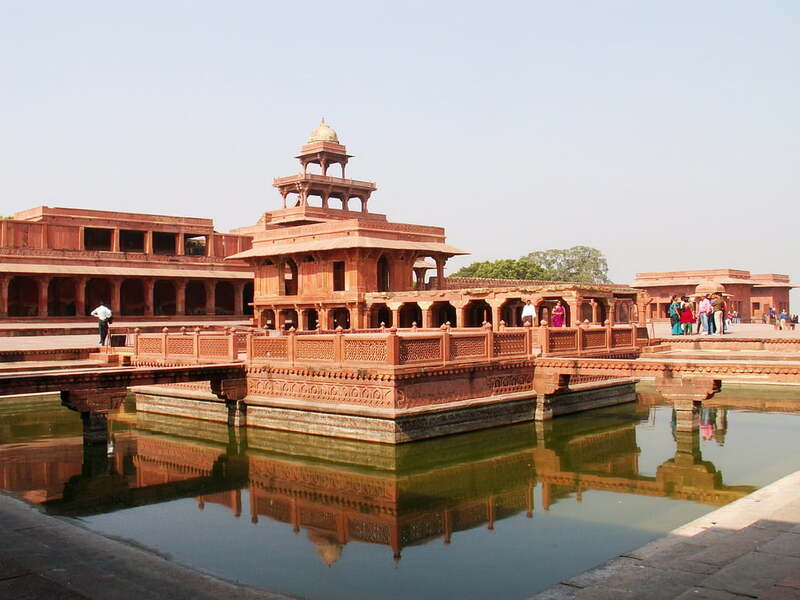 Other tourist spot includes the Rang Mahal, Merchant Havelis and the Fort palace of the royal family. It can be said that this is one of the most popular historical places in India you would love to visit. This place is also known as the ruins of the lost kingdom. The reason being one can find here wrecks of ancient markets, royal pavilions, royal buildings, temples, chariots etc. you name it. In-fact these ruins covering the vast areas of Hampi are the major attractions of these site located in the city of Vijayanagara, at the east-central part Karnataka.Once you are here, you must visit the monuments that are made out of hard and solid granite stones, amongst them the most significant structure is the Vittala Temple dedicated to Lord Vishnu which goes 14th centuries back. 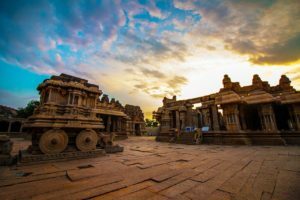 Other places include the most famous market of Hampi, also known as the Hampi Bazar, the Ranganatha Temple, the octagonal water pavilion, Archaeological museum, Nandi statue, Virupaksha Temple, Elephant stables and Durga Temple, are to name a few. Place signifyingthe mix culture of Jains and the Budhhists. This is another most famous and popular touring place that you would like to visit. Simply because it has a blend of cultures depicting of both Jains and the Buddhists. This iconic site symbolises the rising of the Chandela Dynasty. The artistic works associated with there temples will show the symbols that depict timeless grace, splendour, attractiveness, delicacy and off-course, the creative work that is involved in it. Out temples that still exists now is believed to have dedicated to Lord Shiva, Lord Vishnu, Lord Ganesha and to the Tirthankaras.Places to visit will include the western Devi Jagdambi Temple, that is next only to temple of Kandariya Mahadeva. Another significant attraction will be Apsara Dance. More or less it’s an important tourist spot that one should not miss out on. The royal city of Fatehpur Sikri represents the golden era of Mughal art, that is famously known for residence, public constructions, mosques, sectors for the sovereign, the military services as well as the maids.The distinctive feature of this place is the Bulund Darwaza which is about 54 meters tall which was build to honour king Akbar on one of his famous victories. 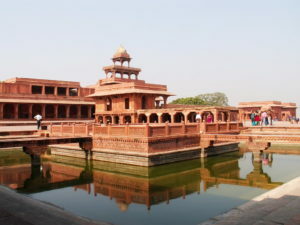 The other talking point of this city is the remarkable Jama Masjid, Tomb of Salim Chisti, the Ibadat Khana as well as Panch Mahal comprises of locations at Fatehpur Sikri. It is believed that Akbar, in order to play with his wives, build a monument called the Ankh Michauli which is also located here.This was a well prepared royal town with created columns as well as decorated support tombs was constructed but also abandoned as a result of the shortage of drinking water. The Qutub Minar, also regarded as one of the extraordinary creations of ancient Indian history is certainly famous and a very popular historical place in India that I would recommend you to visit. It was named after a famous Muslim ruler who ruled most parts of Northern India, Qutub-ud-din Aibak. 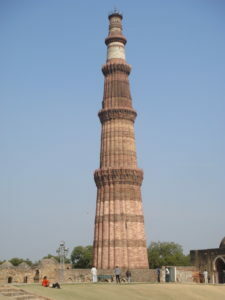 The most interesting fact is that typically the Qutub Minar complex has a tomb made of iron that has not necessarily fallen to rust within 2000 decades. This tomb has carvings that depict several dialects of The Quran in Arabic and Nagari language, which is a significant symbol of Indo-Muslim architectural mastery.The Minar has a 7 m long iron tomb in its courtyard and there is a myth if you fold and pray using your hands although standing with the back to that your desire will be achieved. The very first mosque in India, that is Quwwat-ul-Islam Masjid is also located here. 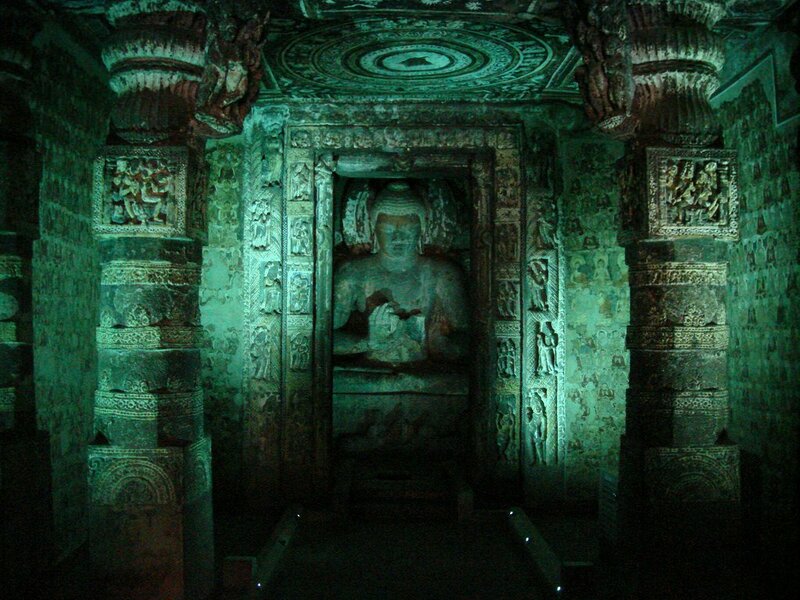 What to say about the Ajanta and Ellora? Words are not enough to describe its beauty apart from saying that it’s a creation of divine art. The Ajanta and even Ellora excavation defines craftsmanship competencies where each individual rock making was produced manually. Here you will find almost 12 caves of Buddhists, 17 caves of Hindus and 5 caves of the Jains which signifies the blend of three different cultures. All these caves here are mainly used for either pray or study purpose. There are about 29 caves in Ajanta that epitomises the famous Jataka Tales dialects that are encrypted in the walls and Ellora features about 100 caves in all. You can also find here the Vihars, a place of meditation of the monks, and Kailasanatha Temple are to name a few. The actual ‘Cavern from the Ten Avatars’ built underneath the reign associated with Lord Krishna. 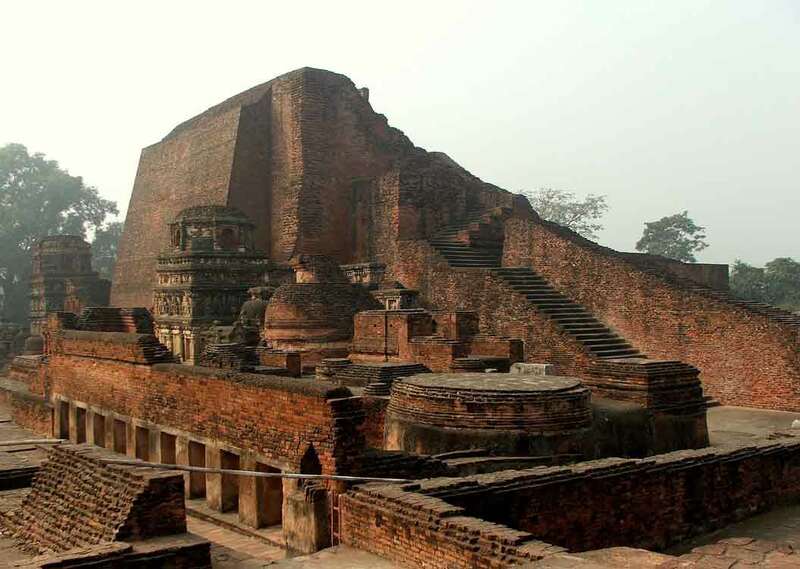 The Nalanda University, located in Bihar, East India, signifies a remarkable place of study, art and culture. This was the first ever University in the World where students could reside and study. A remarkable fact was that almost 2000 teachers and 10,000 students from different parts of the world lived and studied here once. This fact was emphasized by the famous Chinese pilgrim Hiuen-Tsang.Historians from Japan, Korea, China, Tibet, Turkey used to come here for exploration.This university covers about 14 hectares of land and was built following the Kushana design, one of the oldest forms of architecture. A tourist spot here is the Surya Mandir that still exists amongst the ruins.Nalanda was once known for the biggest library in the world at one time. It contained books on all subjects, namely astrology, medicine astronomy etc. 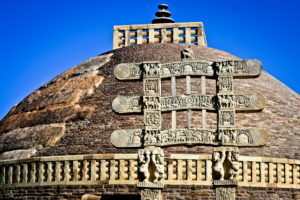 The stupa was built during the empire of the Mauryan’s and It is one of the oldest stupas build in the 3rd century that epitomises the reign of the Buddha. This place signifies the Moksha, that is life and death circle of Buddha. The height of this stupa is about 54 feet. It has four gates or entrances of this stupa depicts several scenes of the Jataka Tales which narrates different stories in the life of Buddha.This iconic structure was built as a study centre for the Buddhists. 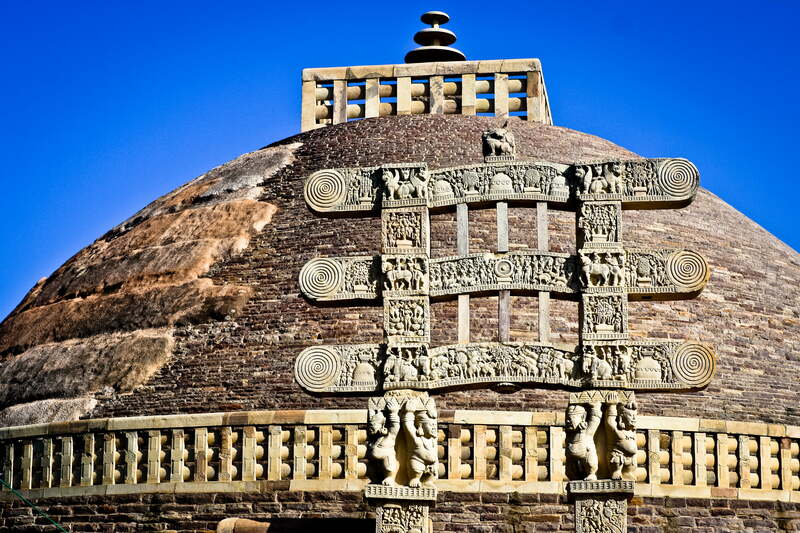 The actual Ashoka entender has 4 lions and it is designed in the Greco-Buddhist pattern which is our national emblem.This is another world heritage place as declared by UNESCO and it can be visited all through the sunset. Build in the year 1591, by Mohammed Quli Qutub Shah, the Charminar stands out as not only a major centre of attraction not only in heart of the city Hyderabad but also in India. No doubt it is a famous and very popular historical place. 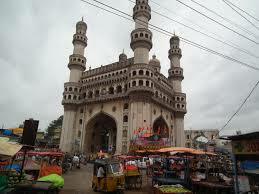 The mosque constitutes about 48 tall tombs and 4 grand arches that is a prime feature of this place. Every minaret of the monument offers four tales and every mid-foot has 1 clock.The Charminar carries the legacy of the Indo-Islamic architecture with an influence of Persia as well. They say that there is a tunnel that leads from the monument towards the Golconda Fort, but apparently, it could not be located till date. Places to visit include the Laad Bazar which is one of the biggest markets of art and crafts and you can find several food joints here also. As the name suggests, this site symbolises the sovereign of the regal family. The Mysore palace is a 3-storey rock structure designed with granite, greyish in colour, having heavy pink marbled stones on the top. It is designed with Indo-Saracenic architecture dealing with the Chamundi Hills, facing eastwards. The makers were the people from the Wodeyars dynasty. The Durbar Hall, which has doors made of solid silver, ceilings made of mahogany, and a range of fascinating paintings of Goddess Sakshi which is a hallmark here. The Great Dushera Festival is celebrated here during the autumn season by lighting 10,000 lights. 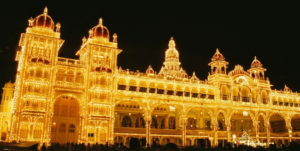 The Mysore Palace also reminds of an era of the royal wedding and also is a mixture of Hindu, Rajput and Mughal Cultures. The Victoria Memorial is a most famous historical place in India, that marks an era of British rule in this country.The notable feature of the Memorial is actually marked having a sixteen-foot-high bronze sculpture of triumph which is installed on ball bearings. The significant feature of this location is that the entire building was built in marble and was dedicated to the then Queen Victoria in Calcutta as a memorabilia. 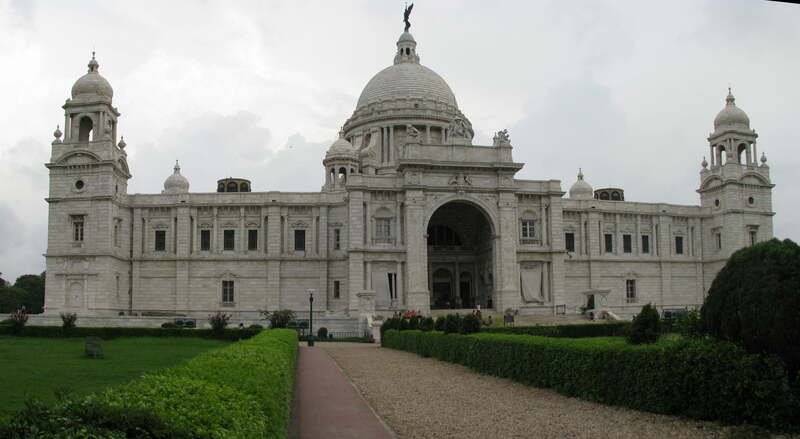 The memorial is fashioned as the Indo-Saracenic revivalist art. This site is one of the remarkable tourist spots in the world because of paintings, sculptors, etc as well as a royal symbol of the Queen that can be found inside this building. One of the significant paintings here includes the Prince of Wales in the year 1976 by the Russian artist Vasili Verestchagin. As the name suggests, this destination place is also known as the“Place of Winds” as because it looks like a beehive honeycomb with about 953 windows.This site is another prime example of architectural capabilities of the Rajputs. It was built in 1799 by a famous Rajput ruler Maharaja Sawai Pratap Singh was known to be a grand follower of Lord Krishna. That is the reason why the walls of the Mahal are built with red and pink sandstones which resembles the crown of Lord Krishna. This palace is the tallest building in the world without any foundation. It has a shape of the pyramid but is curved in nature. 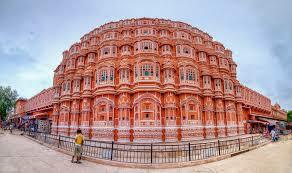 The Hawa Mahal is significantly known for it’s Jharokhas or allows free air passage within the palace. 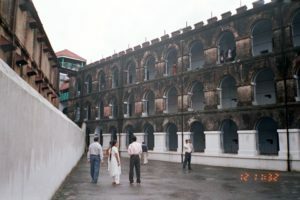 Till now, if you have read the article you must be wondering, why am I talking about Cellular Jail here, and what that has to do with famous historical places?.Well, this is very important to know that dark history of India lies here. Several Indian Freedom Fighters were sent here as a convict to what was commonly known as“Kala Pani”. There were seven points and at the center point, there was a tower from where the guards used to keep watch on the prisoners. Be it hunger strikes or convicts escape this prison has seen it all. This Cellular Jail has witnessed almost the entire phase of Indian Independence. Many Great Indian Revolutionaries like Batukeshwar Dutt, Yogendra Shukla were sent here as convicts of “Kala Pani”. These are few places which have left a remarkable note in my mind and even during the passage of time it has never faded way but has grown instead. I hope you liked the tour with me and the desire to explore our country has grown even stronger in you.